The island of Philae lies one-and-a-half miles south of the old Aswan Dam and is considered , by some , to be one of the greatest achievements of modern engineering . The dam the straight across the Nile for 2150 yards and has 180 sluices. It was built in 1891-1902, rising 130 feet above the bed of the Nile. In 1907-1912 it was heightened to 146 feet and in 1928-1934 it was raised for the second time to 155 feet. This increased its capacity to five billion cubic meters. 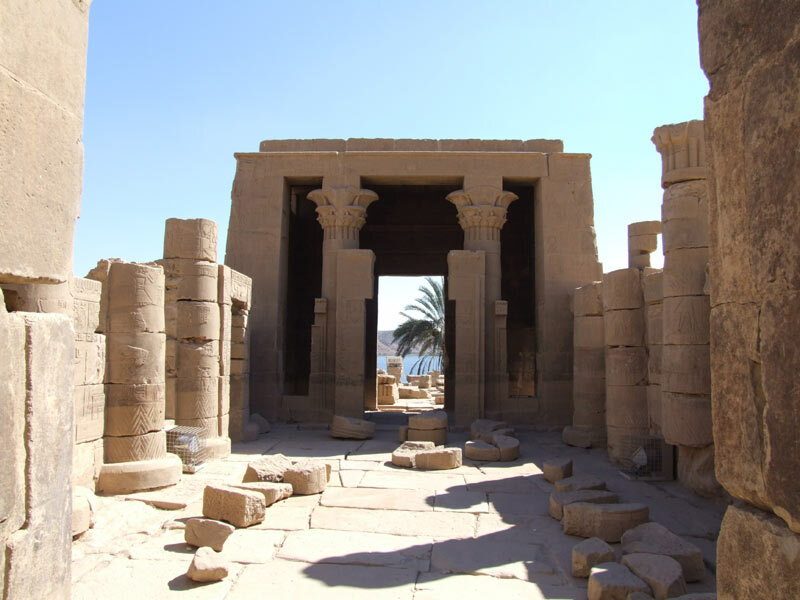 Long before the completion of the dam, scientists and archaeologists ere considering ways to preserve Philae and other temples built in Nubia. Since the benefits of the dam were so great, and since no other site was as favorable, it appeared some of the ancient remains would need to be sacrificed for the welfare of modern Egypt. However, while the erection was in progress , the Egyptian government undertook a major project to save many of the temples of Nubia including those of Philae . The island of Philae formerly ranked as one of the most beautiful spots in Egypt . it was known as the "Pearl of Egypt" because of its many plants, palm trees and striking grouping of temples of sandstone quarried from Gebel Silsila, forty-one miles north of Aswan . here Pharaonic , Ptolemaic, Roman and Christian constructions all blend together in a symphony of symmetry and beauty . The island of Philae is about 500 yards long and 160 yards covered with a thick layer of mud deposited by the Nile . Philae s the smallest of three islands. Ti the west, separated from it by a narrow channel, is the island of Bigeh, twelve times it's size;and a short distance farther in us El-Heseh, three times larger than Bigeh. The island lost much of its charm with the construction of the Aswan Dam . It was only during the summer months of July to September, when the water of the Nile was allowed flow freely through the gates of the dam, the the whole island stood above the water and access could be obtained to all of its temples . For the rest of the year only the upper part of the first pylon of the Great Temple of Isis was visible. 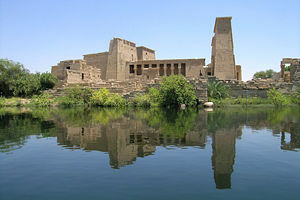 All this was changed by the building of the high Dam or new Dam in 1960-1970, about three miles to the south of Philae. Philae seemed destined for total loss. Its position between the two dams to be permanently above the water , however, the danger would be even greater than before since the base of the temples, up to fifteen feet on height, would be attacked by the flowing waters several times a day. Under these conditions, the monuments would eventually disintegrate and crumble to the ground. Fortunately m the island was rescued in the last of the several salvation enterprises conducted through the joint efforts of UNESCO and the Egyptian government, The plan adopted for Philae was to enclose the island inside a temporary coffer dam of steel pilings, pump it dry , and then remove every stone of every structure and pavement to a storage area on the mainland . These would then be transferred to , and assembled on , the loftier island of Agikia, a quarter mile away. Meanwhile, the island of Agikia to lowered about had to be lowered about 100 feet and slightly enlarged so that its contours would duplicate those of Philae . Work began at Philae in 1971 and ended with the rebuilding of its structures in Agikia island in 1981.